This book contains a collection of contributions that were delivered at the VII International Symposium on Ménière's disease and Inner Ear Disorders, held in Rome on October 17 to 20, 2015, and that were addressing many of the known, but also some of the unknown aspects of this inner ear disorder. Among them, a particular interest has been solicited by the genetic issue involving the inner ear in general and that will surely represent in the future one of the new pathogenetic and diagnostic lines to pursue for the study of the Ménière's population. A great impact is also foreseen by the routine application of specifically-designed imaging procedures that would enable to confirm the presence of endolymphatic hydrops as the real pathognomonic finding of the disease, and to follow-up the affected subjects during its clinical course, along with the role played by the different therapeutical approaches for it. The treatment of Ménière's disease seems also to have taken a straightforward direction towards the intratympanic delivery of drugs, where steroids appear to be promising molecules in this regard, without running particular risks for an additional inner ear damage, as it could be possible when ototoxic molecules are used. For a mono-thematic meeting that gathers all the experts in the field every five years, one would expect to find many novelties and clarifications that had the right time to develop and to be validated. We all know that this would be unlikely to occur for Ménière's disease, one of the most intriguing, somewhat frustrating pathologies that, over more than 150 years since its first description, has kept scientists and dedicated professionals busy for any development that would be helpful for curing our affected patients. 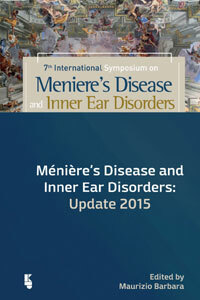 This book contains a collection of contributions that were delivered at the VII International Symposium on Ménière's disease and Inner Ear Disorders, held in Rome on October 17 to 20, 2015, and that were addressing many of the known, but also some of the unknown aspects of this inner ear disorder. Among them, a particular interest has been solicited by the genetic issue involving the inner ear in general and that will surely represent in the future one of the new pathogenetic and diagnostic lines to pursue for the study of the Ménière population. A great impact is also foreseen by the routine application of specifically-designed imaging procedures that would enable to confirm the presence of endolymphatic hydrops as the real pathognomonic finding of the disease, and to follow-up the affected subjects during its clinical course, along with the role played by the different therapeutical approaches for it. The treatment of Ménière's disease seems also to have taken a straightforward direction towards the intratympanic delivery of drugs, where steroids appear to be promising molecules in this regard, without running particular risks for an additional inner ear damage, as it could be possible when ototoxic molecules are used. Noteworthy is also the possibility for a self-administered local pressure treatment to positively act on the disease, allowing to avoid to resort to any surgical procedure for its resolution. The final part of the contributions that have highlighted the Meeting, and consequently this book, is devoted to the rehabilitation of the affected population from the most frequent irreversible damage caused by a long-lasting disease, i.e., deafness. The proposal of cochlear implantation, not only in the classical bilateral cases that would be rare for this disease, but also for the unilateral forms related to a single-sided deafness, is clearly seen as a promising tool to apply for restoration of the binaural auditory function, a problem that, for many years, has been left neglected and untreated. A real novelty for this monothematic Meeting is represented by the report of a possible vestibular prosthesis that would enable mostly the bilaterally-impaired subjects to restore their balance disorder. In summary, with all the limitations that a book containing contributions from a Meeting nowadays carries in term of scientific impact, it is the editor’s wish to promote it so as it could serve, in analogy with the publications of the previous Meetings, as a guide for the young colleagues who wish to get knowledge of Ménière's disease, as a cue for the development of new research lines, or – at least – as a memory of those fascinating days spent in the Eternal City to place on your crowded, hopefully not dusty, shelf. Prof.
Intratympanic or transtympanic drug therapy?